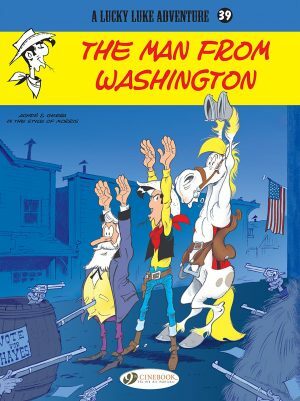 Cinebook’s sixty-second volume of Lucky Luke collects five stories illustrated by creator Morris assisted by M. Janvier circa 1986. How much Janvier contributes artistically is anyone’s guess, but the scripting duties are spread between frequent collaborators Claude Guylois, Xavier Fauche and Jean Léturgie. 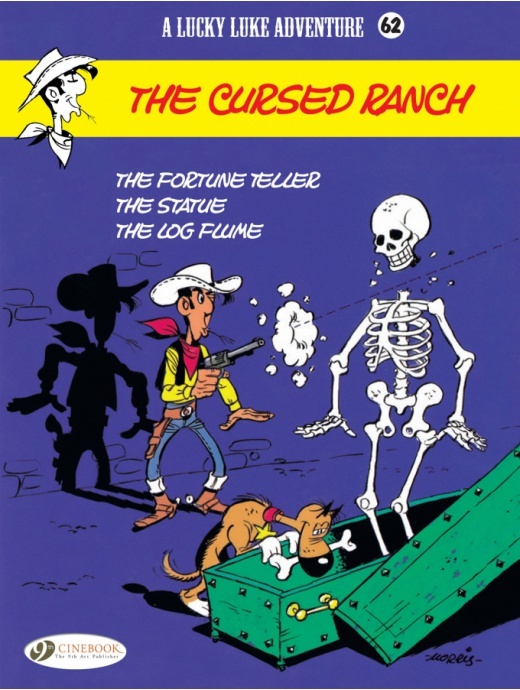 Title story ‘The Cursed Ranch’ features Miss Bluemarket, leaving for Smithville with her three “boys” after oil is discovered and ruins the climate in her old town. 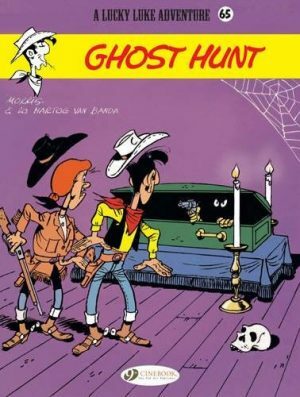 Unbeknownst to her, the house she just bought turns out to be haunted but Lucky Luke happens to be in town and offers to help her investigate. Guylois’ plot pokes fun at the old Hammer Horror films with Morris’ cast closely resembling Hammer actors Christoper Lee and Michael Ripper. Even Groucho Marx shows up as Guylois sends up dodgy realtors and horror clichés. Guylois also pens ‘The Statue’, a yarn inspired by the works of sculptor Bartholdi. 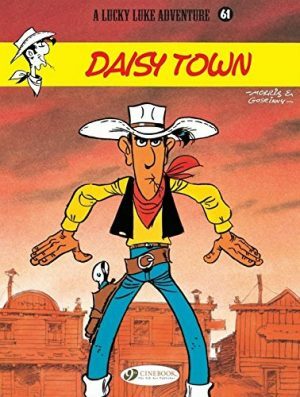 A town wants to honour Luke for his heroism and commission French sculptor Michelangelo Jr. to render it, except a wealthy jealous rancher hires the Daltons to interfere. Guylois loves puns, employing them heavily over both his stories but they work better in ‘The Statue’. The reason is that the addition of 21st century references to the dialogue in the translation, making it more current and by default funnier. 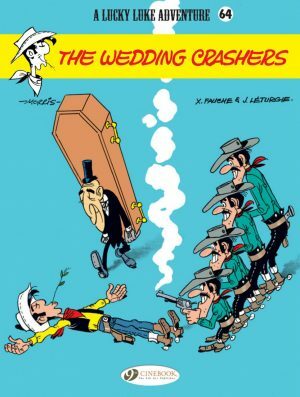 Fauche and Léturgie write ‘The Fortune Teller’ where Luke arrives at the bank only to be refused service because the banker is off to rendezvous with his true love. Apparently it’s because the fortune teller Madame Irma has advised him to do so, but when failed crimes coincide with the banker’s absences Luke decides to keep tabs on both. It’s a classic con tale with a pleasant twist but suffers from brevity, introducing too many ideas to explore in a short time, resulting in too many plot holes. The best story comes from Léturgie on a solo outing. ‘The Log Flume’ revolves around the contraption’s invention, Luke and Jolly Jumper helping the inventor patent the flume before a greedy lumber baron can stop them. There’s enough historical leeway to make a plausible alternative history and still use known information on the flume to generate fun. As far as Morris’s art is concerned, the second half is better. Initially he keeps his backgrounds straightforward with the most attention given to his cast. The landscape eventually becomes just as entertaining but is nowhere near the quality of those bustling scenes Morris crafted at his peak. 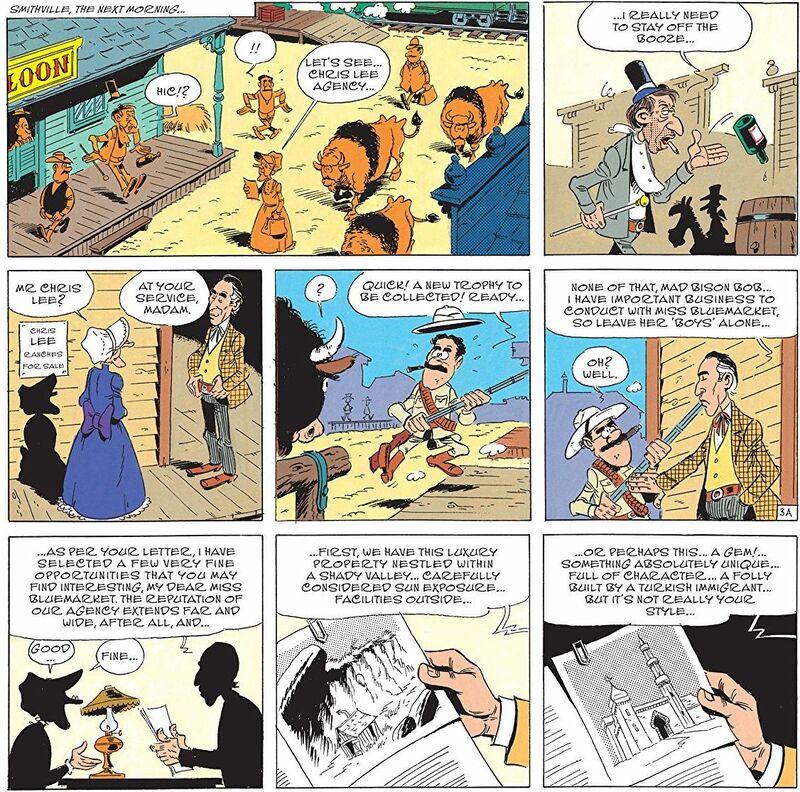 Even so, Morris is an artistic wizard and while the scripts have varying highs and lows, his vibrant caricatures provide entertainment and a few chuckles. In the original chronology Nitroglycerin followed but Cinebook sandwiches The Cursed Ranch right between Daisy Town and Sarah Bernhardt.